Our rum brand is inspired by the life of a legendary figure in Panama history. Pedro Mandinga was a captain of the Cimarron people, who in the 16th century built hidden communities along the Caribbean coast. Pedro was a brave and resourceful leader known for his ability to outwit his enemies. With his intimate knowledge of the inhospitable local terrain, he acted as a guide and partner to Sir Francis Drake. It was in one of these villages that Pedro Mandinga led Drake up a high hill in the jungle where a great tree stood. They climbed the steps cut into its huge trunk. From this spot, both the Pacific and the Caribbean were visible. The two men sat looking at the “doors of the seas, the keys of the universe” as the Isthmus of Panama was called. Despite their different cultures, the two men formed an alliance built on mutual respect and friendship, exemplifying a tradition of diversity and collaboration that defines Panamanian culture today. As trade from all over the world continued to flow through this narrow stretch of land that links two oceans, the bustling city center of Panama’s Casco Viejo became a hub for commerce and a mingling place for cultures. Our Rum Bar, the first of its kind, celebrates this uniquely Panamanian spirit, and proudly brings together world-class craft spirits, authentic local culture and the peaceful mix of the most diverse array of communities in the world. During his thirty years of brewing craft beer, our master distiller, Brad Kraus, would always finish his day with a glass of rum. 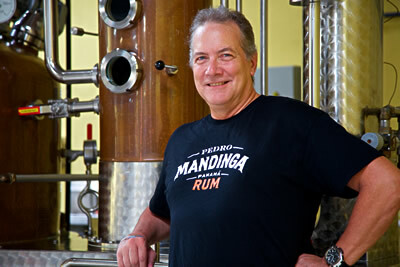 That love for rum and craft inspired him to create Pedro Mandinga Rum. 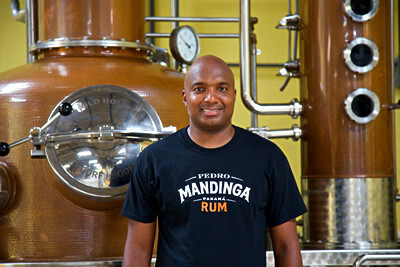 In addition to distilling Pedro Mandinga Silver, he has perfected the recipe for our Pedro Mandinga Spiced Rum by choosing and balancing each spice with care. Brad is originally from Santa Fe, New Mexico, where he was educated as a chemist. He has worked throughout Latin America and has been living in Panama for the past five years. For the past twenty years, Aldemar has been creating craft beverages with natural ingredientes and in small quantities. We are lucky that he decided to become part of the Pedro Mandinga family. Aldemar is a perfect addition with his passion for salsa music, which he enjoys listening to during the day at the distillery as well as in our rum bar. Aldemar was a founding brewer at Bogotá Beer Company. Periódico El Tiempo – Colombia. Revista La Barra – Colombia.